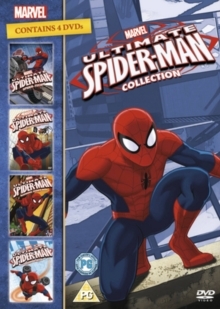 Four-volume collection of episodes from the children's animated series following the Marvel Comics superhero. Midtown High student Peter Parker (voice of Drake Bell) works as his web-slinging alter ego Spider-Man, alongside a group of teenagers with superpowers of their own, to protect the world from notorious villains. The episodes included in 'Spider-Tech' are: 'Great Power', 'Great Responsibility', 'Flight of the Iron Spider', 'Why I Hate Gym', 'Exclusive'. The episodes included in 'Spider-Man Vs Marvel's Greatest Villains' are: 'Doomed', 'Venom', 'Back in Black', 'Field Trip', 'Venomous' and 'Strange'. The episodes included in 'Avenging Spider-Man' are: 'For Your Eye Only', 'Home Sick Hulk', 'Run Pig Run', 'The Iron Octopus', 'Not a Toy', 'The Attack of the Beetle' and 'I Am Spider-Man'. The episodes included in 'Ultimate-Tech' are: 'Awesome', 'Beetle Mania', 'Snow Day', 'Damage', 'Revealed', 'The Rise of the Goblin' and 'Freaky'.